Modern technology depends on a set of 17 elements at the foot of the periodic table. Known as rare earths (REs), many of these metals are highly magnetic, and find use in computing, green power and other technologies. However, because of rising prices, legal issues and the difficulty of mining, safeguarding their supply is a major scientific and political challenge. Several REs, such as yttrium (Y) and europium (Eu), are used as phosphors in fluorescent lamps (FLs). These lamps increasingly replace traditional incandescent lighting, but have a limited lifespan. End-of-life FLs are thus a potentially huge source of REs—an example of "technospheric mining"—but harsh and polluting processes are needed to actually extract these metals from the spent phosphors. Now, a team led by Kanazawa University in Japan has developed a cleaner method. As reported in Waste Management, instead of using acid extractants to dissolve the REs trapped in the spent lamps, the Kanazawa team turned to chelator chemistry. Chelators—organic compounds containing elements such as N or O—bond to metals through electron donation. This allows them to gently leach out REs from the solid mass of a spent phosphor, without the need for strong acids. "An ideal type of chelator compound is known as amino-polycarboxylates," explains study co-author Ryuta Murase. "These are already used to remove toxic metals from solid waste. We found they were also very efficient at extracting REs from spent phosphors—especially yttrium and lanthanum, which are used in the more chemically reactive red phosphors. The best performance was by the chelator EDTA, probably because it forms the strongest complexes with the metals." To bolster the extraction rate, the team added a second ingredient to their process: mechano-chemical energy. 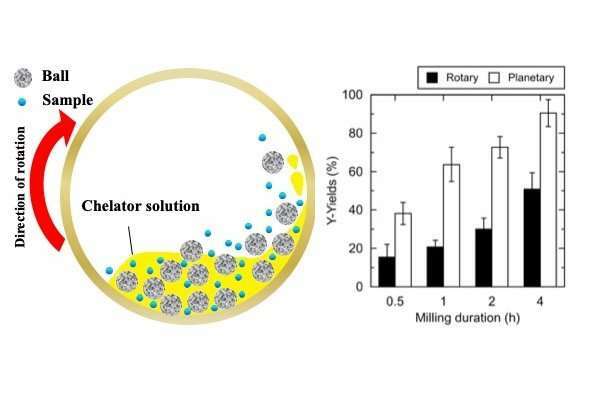 Planetary ball-milling—grinding a solid into fine particles between layers of small, hard balls in a rotating chamber—was found to raise the yield of REs when performed during chelator treatment. This is because, once milled, the greater surface area of the pulverized phosphors provided easier access to the leachable metals within. "We worked hard to optimize the process in every detail, including temperature, pH, milling speed, ball size, and other factors," says corresponding author Hiroshi Hasegawa. "Our efforts paid off, and the most economically important RE metals were leached out from spent lamps with recoveries from 53 percent to 84 percent. Recycling REs will be vital for sustainable technology, and we hope to show that it can be done cleanly and efficiently."